I’m reading “Poke the Box” by Seth Godin. I like reading Godin because it’s inspirational and motivating. He definitely subscribes to the “no excuse” mentality. I’ve got a huge pet peeve and it’s that I can’t stand people that make excuses. 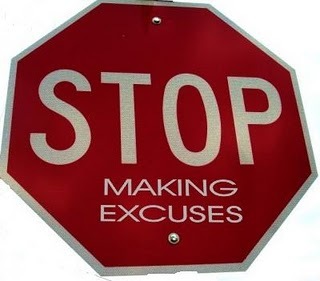 A “No Excuse Attitude” to me means — when you are committed to something you do not make excuses. You figure out how to break through and come up with the results. I look at super achievers and they don’t make excuses, they just figure out ways to make it happen. In the past I’ve written about Nicole Donnelly, an entrepreneur who started Baby Legs. The blog post I wrote about was titled “Fearless Entrepreneur: Nicole Donnelly Overcomes Obstacles in Business and Life“. The reason I mention Nicole is because every time I talk with her she’s telling me about how she got through some barrier and overcame some problem. With that kind of attitude, there’s a reason why she was able to take Baby Legs from a business running out of her apartment to selling her Baby Legs in 40+ countries in less than three years. At the time she was doing this, she had not gone through the Entrepreneurial Masters Program at MIT which she’s currently in her final year. She doesn’t have 10 years of training in launching an international business. What she does have is a insatiable thirst to learn. So the next time someone says to you I’ve never done it before, you have to ask what are you doing to try and learn? The other thing that I know that has helped Nicole is surrounding herself with successful entrepreneurs. She’s a part of the Entrepreneur Organization and she’s always seeking out entrepreneurs that are successful in areas that she may not have as strong a base. She finds people to help mentor her and champion her. People are rooting for her to be successful. You make time for what’s important. You make time to learn. You make time to build relationships and find mentors. Yes, there’s a finite amount of time in a day, but, time is still just an excuse. I like what Godin says in Poke the Box. How many times have you heard “If I just had more money to run this business then I would be successful… be able to make more money… be able to launch this product… get more customers?” I know we’ve all heard it, maybe we’ve even said it. The thing that I keep seeing from my entrepreneur friends is that they find ways to get it done. They don’t have the ability to hire a bunch of Ivy League MBA’s to figure out how to get things done or hire a bunch of expensive consultants to build the road map or execute a marketing plan. What they do, is create opportunity. There’s a lot of really smart people out there right now that don’t have the work experience, perhaps they just graduated from college, or they were laid off in the middle of the recession. These people are dying to get experience. They are want to work on something meaningful. They want to contribute. They want to build their resume up with experiences that will help them get a better job. I’ve seen my entrepreneur friends hire five college student’s who would gladly receive college credit and a stipend in exchange for practical work experience. I’ve seen others hire three work study students and get them to take on various tasks so they could get work and tasks done. I’ve also seen others use ODesk, eLance, Mechanical Turk to get mundane but important tasks done so they can either work less or get other more meaningful work done. One example that we did was hire someone from ODesk to provide us a list of 400 prospects that are specific to our target market. Generating that list took the person four hours and cost us about $25. It allowed my team to focus on more important work but get that task done. Either way it’s not about needing more money versus using the resources that you have more wisely. Do you have any other suggestions on how to deal with excuses? I’d love to hear you share some of the things that you’ve done to overcome these kinds of excuses. How can you create massive demand for your business? Tonight, Paul Anderson with Prolango Consulting will be speaking at a Biznik event where he will address this pressing question. According to the event page, Paul will explain “how to get an explosive number of clients where you actually have to hire more people to service the new demand.” In a time period where most companies are simply trying to survive an economic downturn, I love that Paul is putting on an event that’s more about reaching the goals that you set for yourself before the recession hit than having enough money for the next pay-period. Most new business owners dream about the day that they can hire their first employee. Naturally, this event is packed since recently people have been doing a lot more “dreaming” than they have been “doing.” People want to know what the big secret is to creating demand. But, if we want to be honest with ourselves, we all know that the path to creating massive demand is not going to be one silver bullet. You will have to do a collection of things to get your company to the level that you’ve (to this point) only dreamed of. There are numerous things that you’ll have to do day-in and day-out to make your customers clamor for your business. I know Paul knows this, so I can’t wait to hear about what he thinks the most-important things are. Personally (and probably obviously) I think that having a truly exceptional product and unbelievably good customer service can help you get that demand. But enough about me. What about you? What do you think is one thing that would help create massive demand for your business? * The event tonight is sold out, but you can follow the tweets from the event by searching #Biznik on Twitter (if someone knows the specific event hashtag, please clue me in). On behalf of the board of the Greater Redmond Chamber of Commerce, I want to take this opportunity to thank Chris Hoffman for her service as Executive Director. Chris provided great leadership during significant times of change and economic challenges. She developed strong relationships with city and state officials, advocating the interests of local business. Chris also developed a staff that provides great service to our members on a daily basis. As we all hope in our professional careers, Chris has left the Chamber better than she found it. With leadership changes, comes uncertainty, but also opportunity. That is equally true with this transition. This is a unique time in Redmond. We have a business friendly, city government that has created a new Economic Development Alliance. We have a remarkable school district and world class employers. The Realize Redmond effort has great vision for making our city more livable. It is in times like these that we need to look for alignment of purpose and synergistic opportunities. Imagine city government, school district, chamber, foundation and economic development organizations working toward a common aim. Imagine the compelling story that can be created together and the powerful ability to make that vision come to fruition when organizations like these work together. Truly the sum of these parts can create a greater whole. This context of cooperation and alignment is the environment into which we are going to recruit and hire a new Executive Director for the GRCC. The need to be a consensus builder and a relationship oriented executive are paramount. We think it may take about 6 months to fill the Executive Director position. We will use this time to look at economies that can be created between the GRCC and the Redmond Economic Development Alliance. We will coordinate fund raising activities with REDA and the Realize Redmond organization. Meanwhile we will announce an interim chamber executive director to focus on membership growth and services. Change is difficult and at the same time exhilarating. The board is committed to making this transition as smooth as possible. We are also committed to look at all the possibilities that are presented to us. If you have questions or concerns, please feel free to contact me at tmmartin@evergreenhealthcare.org. I especially want to thank the Chamber staff of Danielle, Carla and Gary for their tireless efforts in making the Chamber successful. On Thursday April 28th from 3-5pm we are having our very own “Bring Your Kids to Work Day” here at thinkspace! One of our member companies, Memetales is hosting the event. Memetales is a publishing platform and gamified mobile book reader for kids. Children read books, get points, earn stickers and unlock games as they go on their reading journey. The mission of Memetales is to get kids to enjoy and love stories and reading. 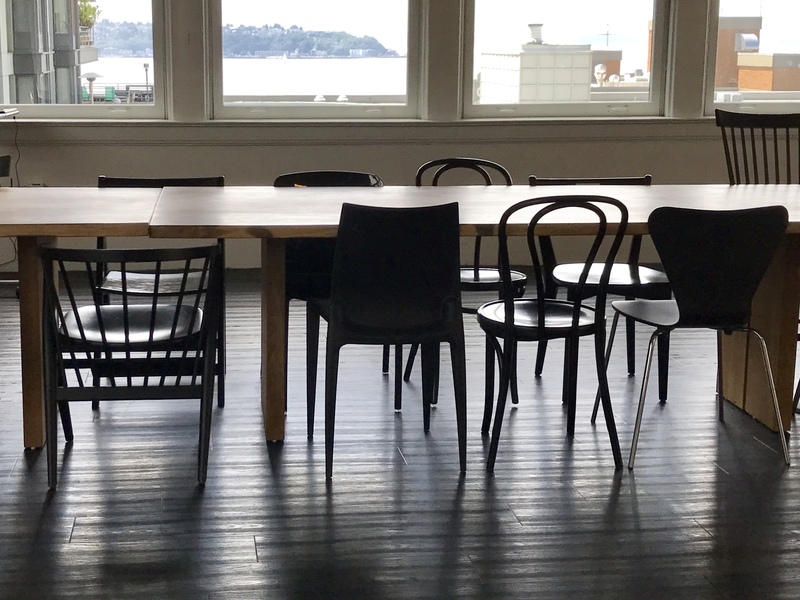 You may have learned about Memetales in one of our previous blog post, Maya Bissiner: Founder of Memetales and Seattle 2.0 Tech-n-Tell Presenter. On “Bring Your Kids to (Our) Work Day,” we are welcoming kids and families to our work space to enjoy a fun couple of hours with yummy snacks, entertainment, crafts and a magic show! Not to be missed MAGIC SHOW! Paul Anderson, founder of ProLango and a thinkspace Member, is presenting next week on “Create Massive Demand for Your Business“! Paul’s spoken a number of times inside thinkspace and was our highest rated speaker at thinkCamp 2010. I highly recommend that you register and attend this event on April 26 from 6-8pm. If you’re used to developing relationships through “elevator pitches”, trying to get media coverage by “press releases”, or charging for “every bit of advice” you’ll not experience a massive demand for your business. By attending this seminar, we’re going to change your mindset and teach you what works instead. • Identify the top 10 influencers you need to know right now. • Use social media tools to research and differentiate your business from your competitors. • Master simple PR-strategies to earn your business both local and national media coverage. • Use existing to earn more coverage, etc. • Learn how giving it away will create a large customer following. 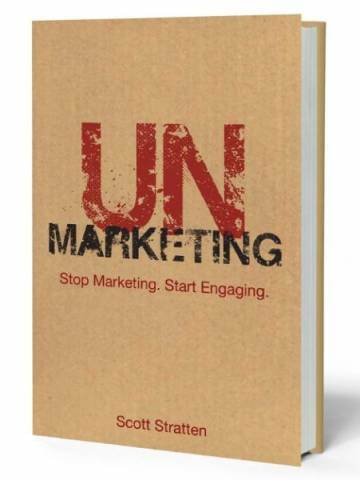 UnMarketing, Relationship Building and… Amazon? Whenever I place an order with Amazon, a subconscious countdown begins in my head. The seconds start ticking by till I might have my next movie, show or, (as in this case) book in hand! Ok, well maybe I’m not actually counting the seconds, but I definitely know which day it should be showing up! I’ve been thinking about the inter-related topics of WOM Marketing, Customer Satisfaction, Company Culture and Lead Generation a lot over the last couple of months. And, the “old school” thought that people do business with people they like seems like it never really went away. It’s the idea that business is built on relationships. 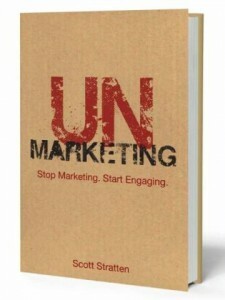 In fact, in the first chapter of UnMarketing, Scott states, “When the need arises, customers buy first from people they know, trust and like.” In my (and apparently, Scott Stratten’s) opinion, marketing is so much more than cold-calling and ad campaigns; marketing is about creating lasting relationships with people. Obviously, you need to offer your customers a reliable, useful and awesome product, but Scott’s book is offering up the idea that you need to care first and foremost about your relationships with your past, present and future potential clients. It seems to me that Scott is headed down the right track – making me even more excited for this book to arrive on my desk at thinkspace! But, what about you – what do you think? https://thinkspace.com/wp-content/uploads/2013/11/website-thinkspace-logo-teal-155x69.png 0 0 Alyssa Magnotti https://thinkspace.com/wp-content/uploads/2013/11/website-thinkspace-logo-teal-155x69.png Alyssa Magnotti2011-04-19 07:30:182011-04-18 14:13:18UnMarketing, Relationship Building and... Amazon? Today Elizabeth Kent, our very own C.H. 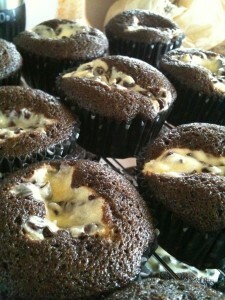 Client Coorindnator, made from scratch Black Bottom Cupcakes to share with all of our CPA’s inside thinkspace. It’s a celebration of having made it through another tax season! The cupcakes are in the kitchen, enjoy! https://thinkspace.com/wp-content/uploads/2013/11/website-thinkspace-logo-teal-155x69.png 0 0 Peter Chee https://thinkspace.com/wp-content/uploads/2013/11/website-thinkspace-logo-teal-155x69.png Peter Chee2011-04-18 13:54:382011-04-18 13:54:38Tax Filing Celebration! 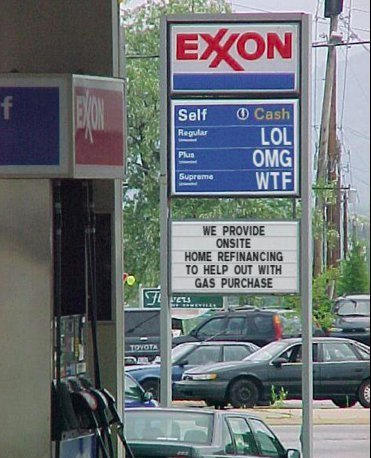 This last weekend was National “Don’t buy Gas” Day. I should have listened. I filled my gas tank up this weekend and it cost me $92 and I’m no longer laughing. It’s more like I’ve reached the “Supreme” level as shown in the picture. Two weeks ago it was $84. That’s about a 10% increase in two weeks. Insane. Back in 2008, I remember gas prices climbing higher and higher, but, it never cost this much to fill the 22 gallon tank in my 2005 Ford Explorer Sportrac Truck. With the cost of gas continuing to soar and by Memorial Day it’s projected to be at $4.50 for regular unleaded, it will cost me about $100 to fill my gas tank. I am looking into some alternatives. It’s time to become more energy efficient, it’s time to stop driving as much. Firstly, I’m thinking of selling my truck and replacing with a Toyota Prius. Secondly, I’m planning on biking into work. On days that I have to do kid drop off or pick up, I’ll have to drive a more fuel efficient vehicle. I really don’t need a truck anymore as I’m no longer doing construction projects so it’s time to get rid of the truck. Those really are my only alternatives as I live don’t live on a bus line and basically if I did bus in, I’d be driving 1/2 way to the office anyway. Biking (btw, we have locking bike storage at thinkspace in the underground parking garage. We also have a changing room and shower). Take the transit. (I don’t think I’ll be crossing the bridge as much anymore especially when they get the toll operational, if I do, I’ll be taking the 545 express to downtown). Take a vanpool or carpool. Telecommute or work in a coworking space instead of driving into Seattle. Get a virtual office (shameless plug). Eating out less. That’s another thing I’m going to be doing as it’s time to start saving some money. Earn a one-time $50 reward from R-TRIP after logging your first 50 alternative commutes, including any combination of walk, bike, carpool, vanpool, and transit. A few months ago one of our divvy users at the time — Maria Zheng, CEO of UrbanQ, introduced me to GasBook an iPhone App that allows you to find the cheapest gas station and also allows you to log your fuel for multiple vehicles. I’ve been using this app for a few weeks and I’d certainly recommend using something like this to save some money! What are some things that you will do? What will you change? Will you do a staycation this summer instead of driving all over creation? Working for a small business can have its ups and downs. As an employee of an entrepreneur, you play a large roll in the daily operations of the business- often wearing multiple hats throughout the day. You live and breathe the successes and failures of the company. Not only because your job depends on it, but also because you work for the person who has put everything on the line to get the business to where it’s at today- there’s an emotional connection there. Some days your head might spin, and other days you may jump and down with excitement as you celebrate a ‘win’ for the day. My favorite thing about working for a small business is the importance of teamwork that comes with it. When your company has less than 10 employees (in our case we have 6), each person plays a very specific role in the team. Each team member needs to show up everyday ready to give it their all if they want the boat to float smoothly. However, I have also learned that when working for a small business… things never go quite as they were planned. And, there is so much more to working for a small business than simply filling your niche in the company. To me, it’s about creating something meaningful with a group of people who are aligned along the same core values. It’s about sharing what you learn with your team as you learn it yourself. It’s about being open to new processes and solutions to problems you didn’t even know were problems. In terms of the team dynamics, what do you do when someone gets sick? Or, someone’s pet is having health issues? In other words, what do you do when life happens and you only have one sales person, or one marketing coordinator? That’s where the ‘team’ in teamwork comes in. As an entrepreneur, you can hire the most qualified professionals for your open position. Or, you can hire people who are highly skilled at what they do and understand the importance of teamwork. When you have team players as employees and coworkers you don’t have to pull your hair out when life catches up to you. You know that your teammates will have your back, and will pull a little extra weight to make sure the boat keeps afloat. When a large company makes a significant investment in a mission critical web-based application I can see how they would be very hesitant to want to upgrade their desktop computers throughout the entire organization to the latest and greatest browser because it would break their application. Thus, we have millions of computers out there still running IE6 and XP. I looked at my Google Analytics and 2.9% of my Internet Explorer website traffic is still using IE6. That’s pretty damn annoying to be honest. I wish that number were zero. The reason is because I know the thinkspace website does not render perfectly in IE6 and therefore it is not providing my website visitor with the best experience. The problem for me is the time it would take to troubleshoot it to make it look perfect. Anyhow, I think their product is a wonderful solution for those companies that want to upgrade their desktop operating system environment but haven’t been able to do so because of their legacy applications that are tied to IE6. I think the entire web development community would also be happy if IE6 would just go away!